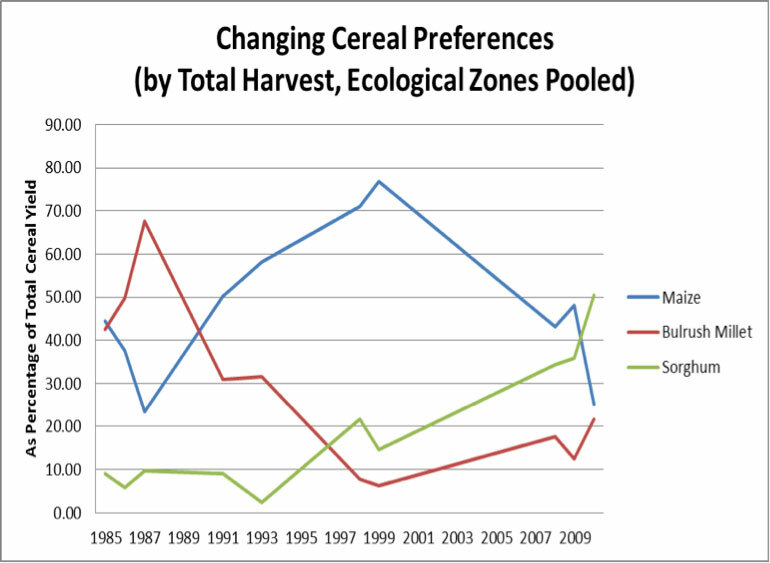 The era of maize in Mazvihwa seems to have ended in 2010 (see the graph of crop yields as collected by the Muonde local team over the last thirty years). 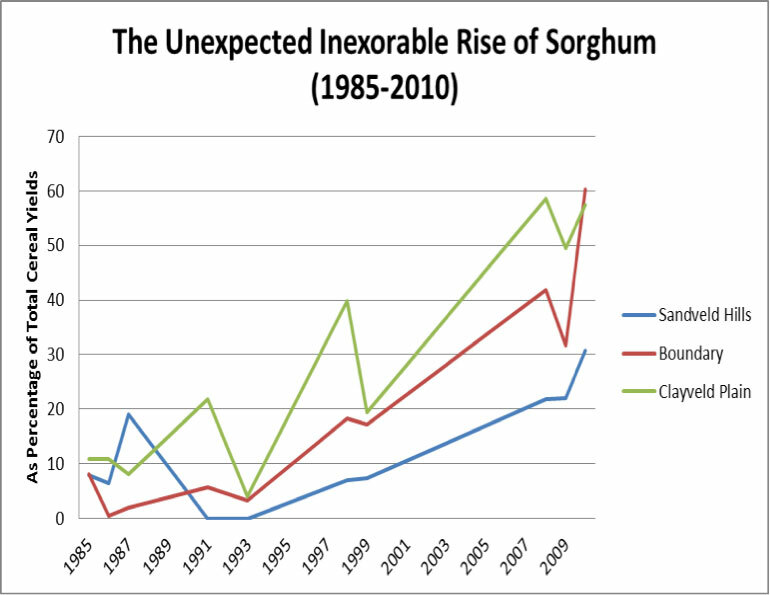 But what is surprising is that it is not bulrush millet (mhunga) that has replaced it (mhunga was the dominant crop since the 1930s to the 1980s) but instead sorghum (see second graph). Furthermore, this sorghum was a land race derived from “Macia”, an open-pollinated white sorghum developed at the end of the 1980s by ICRISAT-Bulawayo under a Canadian IDRC grant which required involvement of village women in seed selection, leading to an astonishingly tasty variety that does not require manual de-hulling before eating. Macia, named for the district of Mozambique in semi-arid Gaza Province for which it was developed, was introduced in Mazvihwa by Abraham when he was working under ENDA-Zimbabwe, and then all but disappeared. It is unclear whether the seeds of today spread across from Mozambique (or from other Zimbabwean or Botswanan introductions) but it is now a dominant cereal over a belt of south-central Zimbabwe, and has been locally adapted by farmer seed selection. Although external agencies still regularly show up with packets of hybrid maize seed for farmers in Mazvihwa on the grounds that Zimbabwe is in crisis because of its absence, the agricultural extension service, which has recovered in recent years in Zvishavane under the capable Mr. Shirichena, is now absolutely clear that small grains need to be the priority in dry areas like Mazvihwa. For all its positive value, “macia” (and indeed sorghums in general) should not dominate the crop portfolio of areas like Mazvihwa because while sorghums may be arid-adapted – producing decent harvests on poor rainfall –they are not good storers in local granaries, so do not enable farmers to build up surpluses in better rainfall years to store for the really bad droughts. For this people need millets, as argued by Mrs. Hove in this video, and indeed they especially need the “rushambo” indigenous land race of bulrush millet. Rushambo stores very well, but just as important has a particularly flexible growth habit. In low rainfall it still manages to produce, but equally important, in high rainfall years it produces additional tillers, in proportion to how wet the season is, and these can keep coming even late in the season. This means in the one in three years when Mazvihwa farmers on the deve (plains) produce 80% of their harvests, rushambo can provide a great yield to store for the drier years to come. 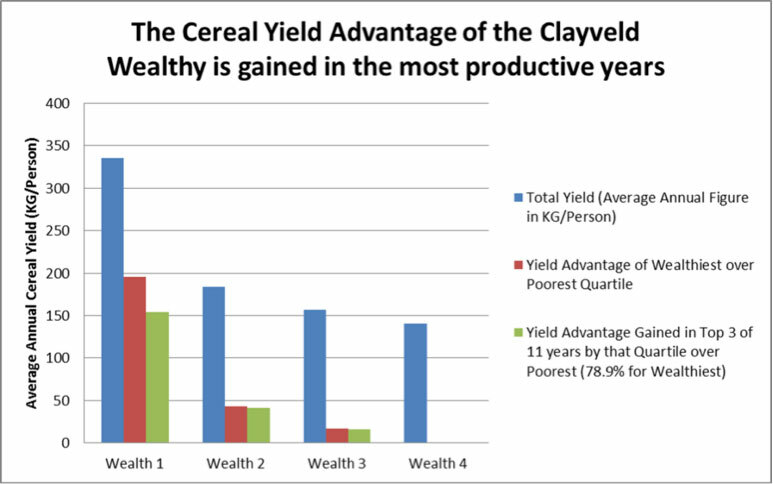 11 years of harvest data from Mazvihwa gathered by local Monde researchers show that nearly all of the extra yield (double on average) obtained by the wealthy successful farmers compared to the poorest was obtained in the three wettest years and not in the drier years. When I told an ICRISAT plant breeder about this in the 1980s (his car had broken down on the road, it wasn’t that he was consulting farmers) he shook his head sadly and explained that these were all the “weedy characteristics” they were trying to breed out of millet to make short season temporally-determinant hybrids that would cycle rapidly through a short rainy season and out-yield all others in droughts. Then (as now) the agronomists believe that African farmers survive droughts based on the yields only in those years (rather than yields in the good years). But doubling yield from say 200kg to 400kg/ha in a drought does in no way compensate for failing to produce 2 tons in a wet year when the hybrid crop was fully seeded half way through the unusually long wet rainy season with a yield of 1200kg/ha. But seed in Mazvihwa is not only about agronomy and economics. As for other indigenous people it is life and identity. Seed is blessed by the mwari and the spirits of the land. And people relish the variety, beauty and deliciousness of their many varieties of every crop. This is especially true with the beautiful patterns on women’s “nyimo” varieties, an indigenous bean called Vigna subterranean, with names like “misodzi yemhembwe” (tears of the duiker).